to the 0.–weloping embryo. Such seeds are called endospermic seeds. in plants like corn, wheat, the endosperm tissue is present in the .ime of seed germination. So these are endospermic seeds. embryo and stored in the cotyledons. Endosperm is formed from the primary endosperm nucleus. Its formation starts before the formation of embryo. Primary endosperm nucleus is produced by fusion of monoploid polar nuclei (secondary nucleus) and a monoploid second male gamete. The endosperm is thus triploid (3n). However in some case, it may be pentaploid (Per aea). It may be even 9n (Pepromia). The cells of the endosperm are isodiametric. They store large quantity of food materials. The storage food is present in the form of starch granules, granules of proteins, or oils. In certain plants, the endosperm cells develop very thick hard walls of hemicelluloses. The parietal layer of the endosperm of grass functions like a cambium. This layer produces on its inside layers of thin-walled cells. These cells are packed with starch. The cells of outermost layer stops dividing. It is filled with aleurone grains. This layer is called aleurone layer. The cells of this layer secrete diastase and other enzymes. These enzymes digest the food stored in endosperm for developing embryo. There are three types of endospenns on the basis of mode of development. These are nucelar type, cellular type and Helobial type. I. Nuclear Type: In this case, the primary endosperm nucleus divides by free nuclear divisions. Wall is not formed between them. A vacuole appears in the centre of the embryo sac. It increases in size and. Therefore, the nuclei are pushed to the periphery along the wall of the embryo sac. Later, walls develop between the nuclei. Thus cellular tissues are formed. divides and walls are formed between the daughter nuclei. These walls may be either transverse or longitudinal. It divides the embryo sac into two cells. Later, these cells divide by repeated divisions. It produces a tissue of irregularly arranged cells. Helobiales (Monocotyledons). In this case, first division of primary endosperm nucleus is followed by a transverse wall. This wall divides the embryo sac into a small chalazal chamber and a large micropylar chamber. Then the nuclei in each chamber divide by free nuclear divisions. But, there are few nuclear divisions in the calazal chamber. The endosperm in this chamber degenerate. Walls develop between nuclei in micropylar chamber. It produces cellular endosperm. by free nuclear division. Therefore, some botanists take it vegetative tissue of the female gametophyte. But this hypothesis is not accepted because it develops as a new structure after triple fusion. :esult of the fusion of second male gamete with the secondary nucleus. Therefore, some botanists consider it a sporophyte tissue homologous to embryo. But the product of this fusion is not a new plant. Therefore, this fusion cannot be regarded as fertilization. This fusion forms a simple triploid (3n) nutritive tissue, not an embryo. First division of Oospore: Its oospore increases in size. It divides transversely in two cells. The cell toward the microphyll end is called suspensor cell. The cells towards other side is called embryonal cell. Embryonal cell forms the major portion of embryo. 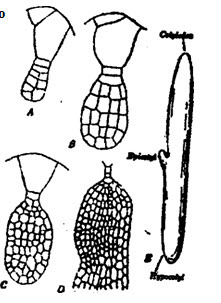 Formation of suspensor and radicle: The suspensor cell undergoes few transverse divisions. It produces short filament of cells called suspensor. The first cell of suspensor enlarges very -nuch. It becomes basal cell. It pushes the embryo down into the developing endosperm. Suspensor also acts as conductive tissues for the nutrients. The last cell of suspensor adjacent to embryonal cell is called hypophysis. Hypophysis divides further to form radicle. octants which are adjacent to suspensor are bypobasal or posterior octant. Formation of cotyledons and plumate: The epibasal cells further divides to form two cotyledons and plumule. Further divisions occur in the cotyledonary cells and bibbed mass of cells is formed. These lobes are primary cotyledons. The plumule and epicotyl is produced in the notch between two depressions. Therefore, plumule in dicot is terminal in origin. Formation of hyg scotyl: The hypobasal octants divide to form mass of cells called hypocotyl. Hypocotyl is elongated. It carries radicle at its tip. Folding of embryo: The developing embryo increase in size. Therefore, it become curved or folded in different ways. 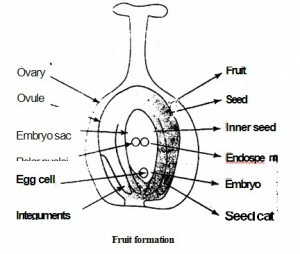 The way of folding of embryo in seed is characteristic feature of each plant. Formation of basic layers of meristem: Two successive divisions occur in octants. It produces three layers. The outer layer is called dermatogen, middle is called periblem and central one is called plerome. Dermatogen gives rise to epidermis. Periblem gives rise to cortical portion. Plerome forms the stele in the centre. Its zygote divides by a transverse wall into a terminal and a basal cells. The basal does not divide further. It enlarges to form a vesicular cell. The terminal cell divides transversely to form proembryo. The proembryo at this stage consists of three cells, upper, middle and basal cells. Fhe lowermost cell of the proembryo divides by a longitudinal wall. It then divides by transverse and longitudinal walls. Thus eight cells are formed. These are arranged in two tiers. Each containing four cells. 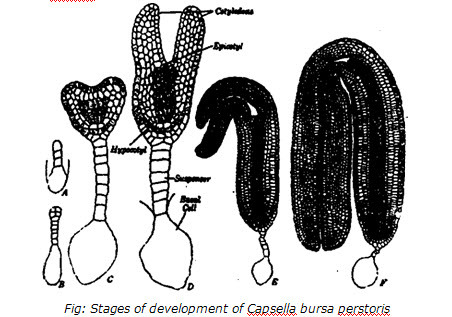 Apospory: The development of an embryo-sac from the sporophytic cell, generally the nucellar cells, without undergoing the usual meiosis or reduction division is known as apospory. In apogamous cases the normal oosphere or one of the synergids, or one of the antipodal cells may develop into an embryo without the involvement of normal fertilization. If the cells involve involved are haploid then the embryo would also be haploid. The resulting plants are generally sterile. If such are diploid then the embryo and the resulting plant would also be diploid. It will be fertile pant. Cleavage polyembryony. In this case, more than one embryo may be produced from a single oospore. In such cases, all the mbryos may not survive till the maturation of the seed due to the mutual competition. Adventitious polyembryony: More than one embryo may be produced in a single ovule due to the development of certain nucellar cells. These cells changes into embryos in addition to the normal embryo which develops from the oospore. Such cases are known as Adventitious polyembryony. In the ease of Citrus upto ten embryos have been recorded in the mature seed. Sometimes, embryos may develop from synergids or antipodal. Embryo from oospore is also there. Thus polyembryo are formed. The stimulus of fertilization also causes changes in the ovary wall. It becomes the fruit wall or pericarp. The ovary wall may become dry and hard giving rise to dry fruit. Or it may become soft and fleshy giving rise to the fleshy fruits. The development of the fruit from the ovary wall is one of the chief characteristics of Angiosperms. The development of the fruit ensures the protection and maturation of tilt; seed. It also provides an efficient means of seed dispersal. In certain cases other parts of the flower such as calyx or thalamus may also take part in the formation of the fruit. It some’ extreme cases, the whole inflorescence may be involved. Such fruits are called pseudocarps. Examples of these types are pear, apple, pineapple, strawberry, fig, mulberry etc. In certain plants the fruits may be produced even without the process of fertilization. Such fruits are generally seedless and are known as parthenocarpic fruits. Everything About Botany. It stimulates the development of endosperm.